Progressive profiling is incredibly powerful for any product or service-based business, and it will help your personalized marketing by leaps and bounds. Do you know everything you would want or need to know about your leads? Do you wish you knew more about their goals, what problems they are struggling with, or even the size of their company? Having the right information about your prospects can be the distinction between closing the deal or losing the lead. Many companies struggle with defining their ideal buyers and many times salespeople get on the phones with prospects without even knowing what the prospects biggest challenges are. With the increase of personalized marketing, the need to collect the right information from leads is of top priority. Personalized marketing helps salespeople close more deals and marketing teams know what to write in their messaging. Personalized marketing goes beyond just writing, Hi <<first name>>, in your emails. When you know more information about your prospects you’re able to use their answers, their verbiage, when marketing to the or writing content on your website. To get a clearer picture of what I’m referring to let’s review an example. A new visitor arrives at your website and downloads a meal plan; her name is Sandra. In order to download the first guide, Sandra needs to fill out three input fields on a form: name, email, and her biggest struggle when it comes to working out. Sandra comes back to your website next week and downloads a workout guide. This time, you ask Sandra two other questions she needs to answer in order to download the free guide: her workout goals and the single thing holding her back from reaching her goal. Sandra’s profile is building up with valuable information she is providing you. You now use this information when marketing to her specifically. Do you see how this personalized context will help you have a deeper connection with your prospects and get more clients? The same personalized approach applies to online companies, and you have even more data on your customers because all transactions are made online. In this example, let’s say you own a fashion e-commerce clothing store. A new visitor arrives to your website. Her name is Amber. She peruses the section of your website called Clothing Essentials. In this area, you provide a free outfit guide, “How You Can Make 30 Outfits Out of 10 Clothing Essentials.” Amber downloads the guide by providing you her name, email, and single biggest challenge when it comes to personal style. With just this one question and before they buy anything, you would be able to email her directly about her personal style struggle. You know she’s interested in clothing essentials, and she wrote that her biggest struggle is finding the perfect fit. In your next email, you mention these two important points. “Amber, finding clothing that you love and can mix and match to create a variety of looks is hard enough. But not buying the perfect fit makes having a closet full of pieces that you love that much harder. Everyone just wants to be listened to. Do you believe Amber would be more likely to act if she received an email that was personalized just for her? You bet! How do I use progressive profiling in order to use personalized marketing for my business? Marketing automation services like HubSpot, Marketo, and Eloqua offer progressive profiling. If you don’t have any marketing automation software, we suggest checking out HubSpot and scheduling a demo with a member of our team to see how HubSpot can work for you. Let’s walk through the step by step process of setting up progressive profiling in HubSpot. Your HubSpot form will be populated with default questions. First name, last name, and email are the three questions that everyone usually asks first, but you can also switch one out for another question. For example, you could remove the last name and replace it with the biggest struggle question. Depending on how “valuable” the offer you’re giving away is, you could also add a question instead of removing one to keep three. Progressive profiling replaces questions with new ones every time your lead comes back to your website to download a new offer. To have these questions be “smart,” make sure you click the smart icon. Once you have your default questions set, add your queued questions to the same form. These questions replace the three default questions if they have already been answered. They are queued in the order you place them. Make sure you have enough questions to fill the form each time. If you have three default, have three queued questions. It only takes three steps in HubSpot to start using progressive profiling. Once you have this set up for each of the forms on your website, you can start building a profile for each of your leads. I just provided you with two examples of how two different businesses can use this powerful marketing and sales tool. 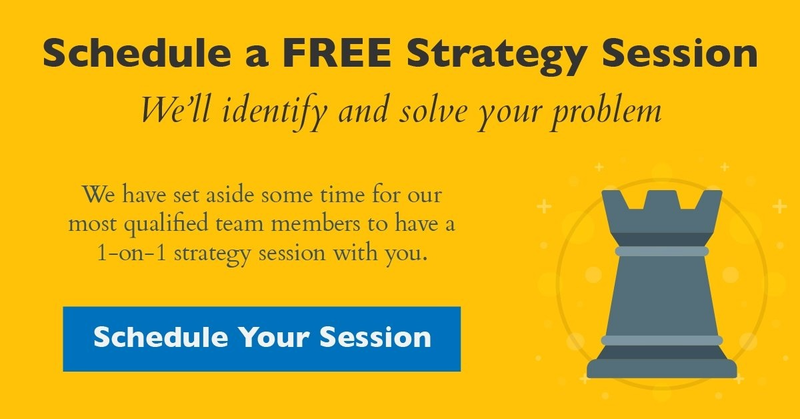 If you would like to know how you could implement it in your business, schedule a free strategy session with one of your consultants.